In a recent survey, Apple's soon-to-disappear AirPort was ranked the most popular Wi-Fi router. I’ve seen the future of Wi-Fi. It’s called Eero. It comes in a pack of three, costs an arm and a leg, but boy is it worth it. Eero is a slick system of mesh-connected routers that blanket your whole house in Wi-Fi. Eero promises to eliminate dead spots, make restarts redundant, and offer blazing speeds from the basement to the attic. 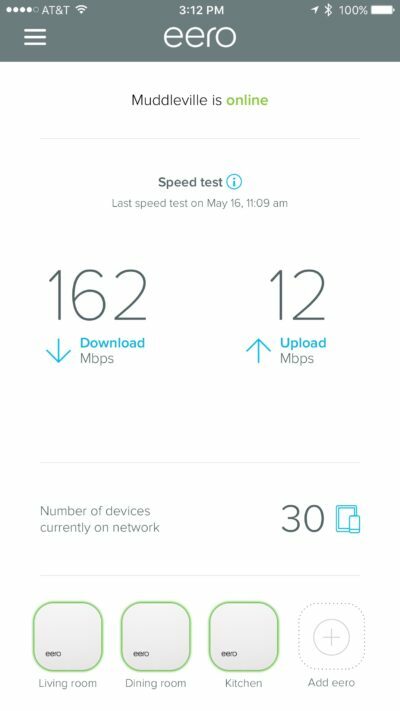 In my tests, Eero performs as advertised. After years of Wi-Fiheadaches, and an Apple Time Capsule that barely worked, we now have fast and reliable Wi-Fi all over the house. The new Eero router resembles Apple’s Airport Express base station, but is a little larger. We’ve always used Apple’s Airport routers; most recently a 2015 Time Capsule with multiple antennas and dual-band networking. It’s a nice box, great for backups, and works great close to. But coverage outside a limited range drops off fast. It barely works upstairs, in the back kitchen, or a family room out front. I’ve tried extending the network with an Apple Airport Express and extenders from third-parties, but they just make things worse. They required constant reboots and endless tinkering with the settings. I gave up in the end and we just learned to live with the multiple dead spots. 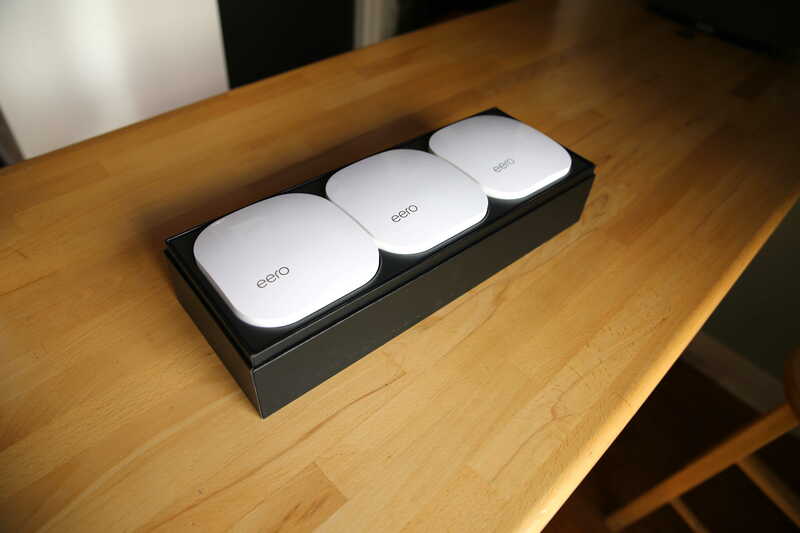 Enter Eero, which in a couple of weeks’ testing has worked flawlessly. So far, it hasn’t suffered from any unexplained dropouts or required any restarts. Recently introduced by a San Francisco startup, Eero is a system of connected routers that you install around the house. The small white boxes create a reliable, self-correcting mesh that monitors performance and interference, adjusting itself accordingly. The boxes are sold separately (ranging from $199 for a single Eero to $499 for a pack of three), but the company recommends installing multiple devices. I was sent a pack of three for testing. Each box is about 5-inches square and just over an inch high. They’re made of shiny white plastic and have an Apple aesthetic. On the back there are two Gigabit Ethernet ports, a USB port and power. The Ethernet is for hardwiring a connection or attaching a network device like a hard drive for sharing files or backups. I plugged in our old Time Capsule, which continues to function just fine for Time Machine backups. 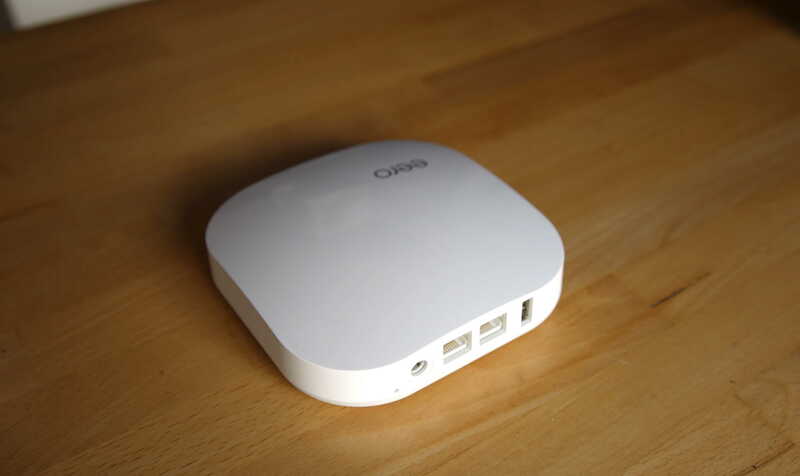 Technically, Eero is a modern 802.11a/b/g/n/ac dual-band router. It has 2.4 GHz and 5 GHz radios, 2×2 MIMO, and is Bluetooth Smart “ready.” Its Bluetooth 4.0 radio isn’t currently used for anything except the initial setup process. At some point it might be possible to use Eero as a hub for Bluetooth devices like smart bulbs or door locks, but for now, it’s turned off. 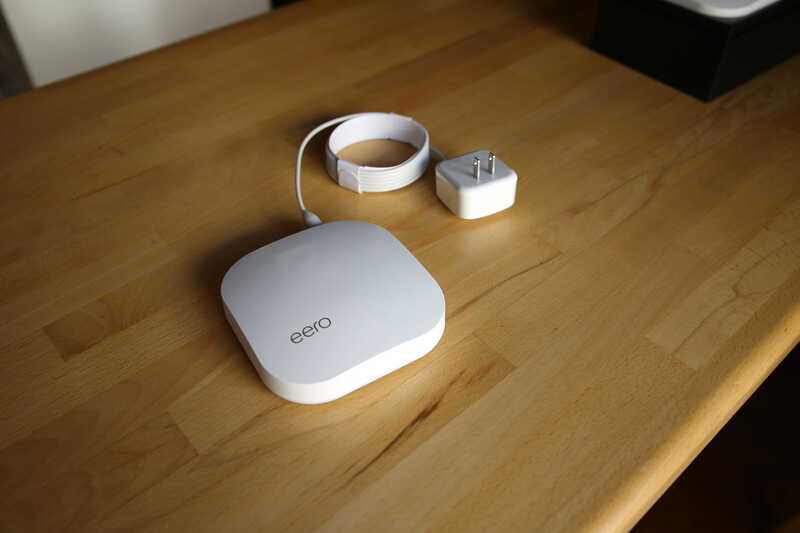 Eero uses WPA2 personal wireless encryption and supports VPN passthrough and UPnP. The setup was very, very easy — perhaps the easiest setup of any hardware in recent memory. I downloaded the app, attached the first box to our cable modem, and input a couple of settings (network name, password and turned on optional guest networking). That’s it. Then I added the second box and then the third, naming each as I went to identify them in the app (“living room,” “kitchen,” “basement”). It’s all wizard-based and idiot-proof. The app recommends optimal placement — no more than 40-feet apart, and preferably line-of-sight. The three hubs create a self-monitoring mesh network with a single SSD, so that throughput is maintained throughout the network. According to the company, traditional Wi-Fi extenders cut bandwidth in half because they have only one radio for broadcasting and receiving. Eero has two. Setup took me about 10 minutes. The network is controlled via the well-laid out app. And when I say controlled, I mean monitored. There’s not much to do. The system is “self-fixing,” adjusting stuff like bandwidth and interference and adjusting itself automatically. Fixes and updates are pushed automatically from the cloud. When I was done, the app tested the network’s speed: a cool 220 Mbps down, and 12 Mbps up. Wireless network speeds are tricky, depending on myriad factors like the modem’s speed and time of day, interference from neighbors’ networks, the number of devices connected and what they are up to. But in general, the Eero network has maintained speeds of about 160 Mbps, with about 30 devices connected at any one time. That’s plenty of bandwidth for the whole house. Streaming the highest-quality 4K HD video only requires a 25 Mbps connection. There have been plenty of evenings when we’re running everything at full pelt — two Apple TVs streaming HD video, XBox games, music playing through Sonos, and simultaneous iCloud and Dropbox syncs running in both directions. So far, no glitches, stuttering, pixelated pictures, or the need to restart anything. There are a couple of quirks worth mentioning. 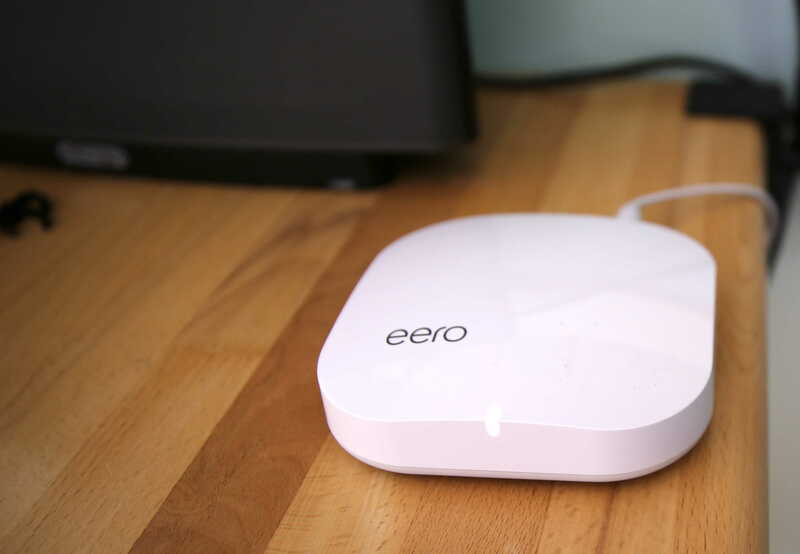 The Eero operates on two fixed channels. It can’t hop around channels like other routers. If your neighbor is using the same channel, it might cause interference. 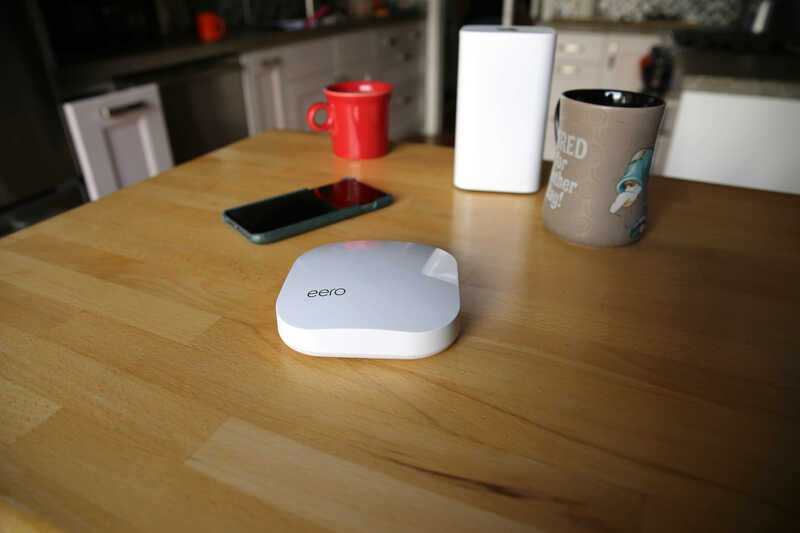 Eero relies on an internet connection to access its settings. If your home Internet is down, you might not be able to access the settings in the app. However, this is only a problem if you can’t use your cellphone’s connection instead. The big downside is cost. Eero is $199 for a single box, and $499 for a pack of three. That’s twice the price of many cheap but highly-rated routers available on Amazon. For example, you could get the highly-rated TP-Link Archer C7 for about $90, and throw in a couple of range extenders for $80 apiece. The total is $250, half the price of three Eeros. Or you could pick up Apple’s cheapest 2TB Time Capsule and a pair of Airport Express base stations for about $499, and get everything Eero offers and wireless backups for your Macs. However, in my experience the Apple setup is less reliable and harder to set up and run. Your mileage may vary, but I’m sticking with Eero. The expense is worth it for the strong, whole-house coverage, the ease of use and the lack of headaches. 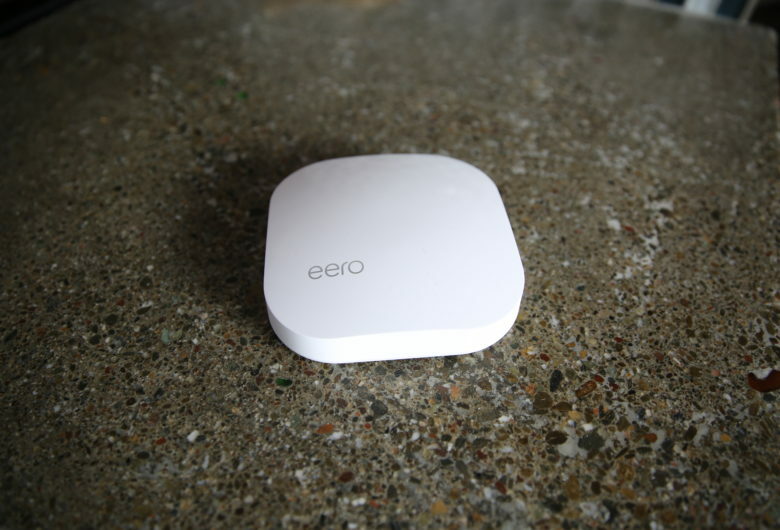 Eero provided a review unit for this article. Read more reviews. Here’s Cult of Mac’s reviews policy.